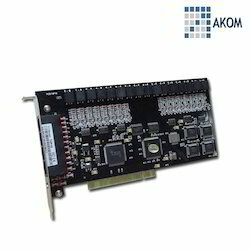 Leading Manufacturer of pci recording card, 32 port pci card, pri voice logger, pri recording card, pri card and telephony card from New Delhi. 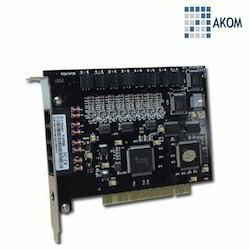 Being the foremost organization, we rule the market by offering an exclusive collection of 16 Port PCI Recording Card. The offered products can monitor every real-time conversation of Extension and can play phone recording and backup file swiftly according to user's need. Apart from this, our offered array is highly appreciated among our clients for its attractive features. Innovation is our forte and manufacturing, trading along with supplying of PCI Recording Card from our side is a strong example of the same. These can monitor every real-time conversation of Extension and can inquire and play phone recording and backup file swiftly according to user's condition. The system has automation backup function, extension record, calls charge and no record and so on functions. Channel: 08 Channels, it can expand 8 pcs to be 64 channels. Recording start mode: Voltage, Key, Sound control. Calling Monitoring: Signal sound Voice Polarity reversal. 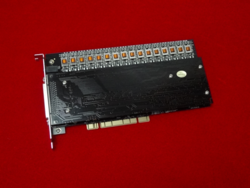 32 Port PCI Card can monitor every real-time conversation of Extension and can play phone recording and backup file swiftly according to user's need. Apart from this, our offered array is highly appreciated among our clients for its attractive features. We have trusted names in the industry in offering a wide range of PRI ISDN Card. The offered cards have an embedded ARM processor, DSP architecture, and built-in PCI plug-in design. 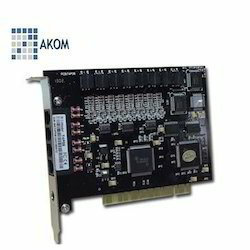 In this card, the high resistance input port and record gateway can directly bridge the trunk line which needs to be monitored. Additionally, offered cards can be made available in bulk quantities. Our organization is well known in the market for providing a broad assortment of 2 Port PRI Recording Card to our clients. These products are assembled using optimum quality components. Apart from this, one can purchase these products at the reasonable price from us. The offered card is designed by using sharp edge technology and advanced machines by professionals who have years of experience in this domain. Our organization is well known in the market for providing a broad assortment of 2 Port PRI Card to our clients. These products are assembled using optimum quality components. Apart from this, one can purchase these products at the reasonable price from us. The offered card is designed by using sharp edge technology and advanced machines by professionals who have years of experience in this domain.